Is this school only for French nationals? Not at all. Anyone who wishes to pursue a French-inspired education can attend Ecole Jean-Jacques Rousseau as long as they follow the admission procedures. Do you give priority to French nationals? No, however as a French-based bilingual school following the French education system, we like to make sure that the families who are not French are committed to supporting this type of education for their children and participating in EJJR community. 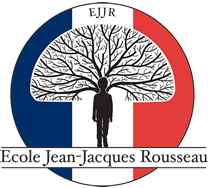 What is the percentage of the French population of Ecole Jean-Jacques Rousseau? Roughly one-third of the school’s population is French speaking and/or French-American, and two-third is U.S. and/or other nationalities. My son is seven months old; how early can I apply to your school? The application process for preschool starts in the fall preceding the school year being applied for, not before. We recommend starting the process when your child is 24-30 months old if you are applying to Petite Section level (3 years old program). Do I have to call for an application? No. Parents have until February 1st to submit an application, unless applying for financial aid (the deadline is January 1st). All applications are reviewed provided they arrive within this time frame. But the earlier we receive an application, the sooner we can start the interview and evaluation process. I submitted an application in early September. Why is my son being put on a waiting list? The admission decision does not depend on how early one sends his/her application. Rather, it is based on a whole package that is reviewed by the school, taking into consideration the evaluation of the child, the parents’ interview, the family’s motivations, the contents of the application, and other larger criteria designed to foster an ideal community of learning for all. What is your cut-off date? Our cut-off date is December 31st; in other words, children have to be 3 years old by December 31st of the year they are applying for. My husband and I don’t speak French; is this problem? We welcome non-French speaking families to Ecole Jean-Jacques Rousseau, but parents should understand that it is a commitment to choose the French education system in an English-speaking family environment. All parents must be committed and willing to expose their children to the French language and the French culture outside of school. What language do children speak among themselves? In the lower levels, the children speak the language they are most comfortable with, whether it is French or English, but mostly English. In the upper levels, as the students are becoming fluent in French, the French language seems to be dominant among the students, especially in the presence of their French teachers. How is the cycle system works in terms of grade level from preschool to Elementary? Our classrooms reflect the French System of Cycles. Students of Cycle 1 are 3 and 4 years old (Petite and Moyenne Section). Students of Cycle 2 are 5, 6 and 7 years old: Kindergarten; Grade 1 and 2 (Grande Section, CP & CE1). Students of Cycle 3 are 8 to 11 years old: Grade 3, 4 and 5 (CE2, CM1 & CM2). The maximum number of children we can accommodate in each classroom from Pre-Kindergarten through 8thth Grade is 12. Are all the teachers from France? Most of the teachers who teach in French are from France and hold the appropriate training to teach in a French school. The English-language teachers are English native speakers and hired locally. There is no uniform but there is a dress code. Please refer to the Parent Handbook provided by the school. Where do most students go to when they graduate from Ecole Jean-Jacques Rousseau? Students of EJJR leaving at a Middle School Level have the choice to transfer to any US or French Middle School, public or private. However, because of the advanced academic level of Ecole Jean-Jacques Rousseau, the school recommends a transfer to preparatory school to better match our students’ academic level and training. In addition, by offering a performing arts program, EJJR students can choose to transfer to other US performing arts schools in the Austin area. What is the difference between OIB (Option Internationale du Baccalauréat) and BAC Standard? While Ecole Jean-Jacques Rousseau does not offer a High School level at this time, the course framework and the academic preparation will help students continue into the OIB French program if they transfer to other French schools or into the IB program of US high schools. The French baccalauréat (called BAC) is similar to a U.S. high school diploma; however it is internationally recognized for the stringent requirements that must be met to achieve it. Bilingual speakers may choose to pursue Option Internationale du Baccalauréat (OIB) as an option inside of the French BAC in the same way students can choose “option music” or “option art.” This option impacts the students’ English and history-geography courses providing the opportunity to take the highest level of English and to experience a more intensive bilingual/bicultural history-geography class. The BAC Standard is a term that refers to the French baccalauréat without the OIB option. What is the difference between OIB and IB? The IB stands for International Baccalauréat. As it is not a French exam, it is not usually offered by French schools. However, some of the French international high schools may offer the IB program within their English Section. The OIB is a school leaving certificate combining the French baccalauréat with extra subjects taught and examined in a foreign language to the same standards at university–entrance level as their country of origin. To obtain the OIB, candidates must pass specific papers in language, literature and history & geography (or mathematics in the case of the Chinese OIB) in addition to their chosen programme of the French baccalauréat. The OIB was developed as a special version of the French Baccalaureate, based on partnerships between the French Ministry of Education and a number of foreign authorities. The governing body for the OIB is the CIEP, responsible for the organization and the administration of the annual examinations and being under the direct tutelage of the French Ministry of Education. The IB programme is designed for children aged 3-19 and more than 3900 schools around the globe have chosen to teach it. The International Baccalaureate diploma (IB) is a school leaving certificate awarded for the successful completion of a two-year educational programme primarily aimed at students aged 16–19. The IB is an internationally accepted qualification for entry into higher education. The IBO (International Baccalaureate Organisation) is the official body administering this diploma. The IB is currently taught in English, French and Spanish. The schools offering this diploma have to be officially authorized by the IBO and must follow their curriculum and guidelines. As the syllabus of the IB is different from the one leading to the French baccalauréat, it is considered a foreign diploma and therefore access to French higher education is not automatic and has to be granted by the dean of the desired institution.